Jann began practicing yoga in 2000, initially to help heal a repetitive strain injury and to better handle the physical and mental stresses of the workplace. Soon thereafter she was introduced to Iyengar yoga, and was immediately drawn to the discipline and depth of the practice. 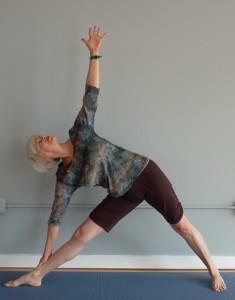 After retiring from her first career as a geologist, she began teaching yoga in 2005. In 2011 Jann achieved certification at the Introductory II level in the Iyengar system, equivalent to RYT 50D-hour certification in the Yoga Alliance system. Jann’s goal is to share with others the mental, spiritual and physical benefits of a regular yoga practice. Her classes focus on learning proper alignment in each asana (posture), providing individualized modifications to help every student enjoy a safe yet challenging practice. Jann regularly participates in workshops with senior Iyengar teachers, and is furthering her studies under the mentorship of Randy Just, director of the BKS Iyengar Center of Dallas.